Teaching Authors--6 Children's Authors Who Also Teach Writing: Turtle, Turtle, Watch Out!--Announcing Our Winner! Turtle, Turtle, Watch Out!--Announcing Our Winner! 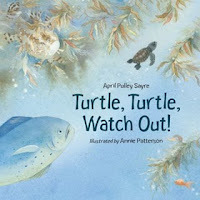 Mag is the winner of the autographed copy of Guest Teaching Author April Pulley Sayre's new book Turtle, Turtle, Watch Out! Congratulations! Thanks to everyone who sent us turtle and tortoise stories. We enjoyed every one!